If you deploy the DWL-8200AP into your network you will have a powerful access point that allows you to split traffic between 11a and 11g bands with central management functions and high level of security. This makes your network more flexible, secure and easy to manage which will save both time and cost managing your network. The DWL-8200AP is a business-class 802.11a/g dualband access point that provides secure and manageable dualband wireless LAN options. 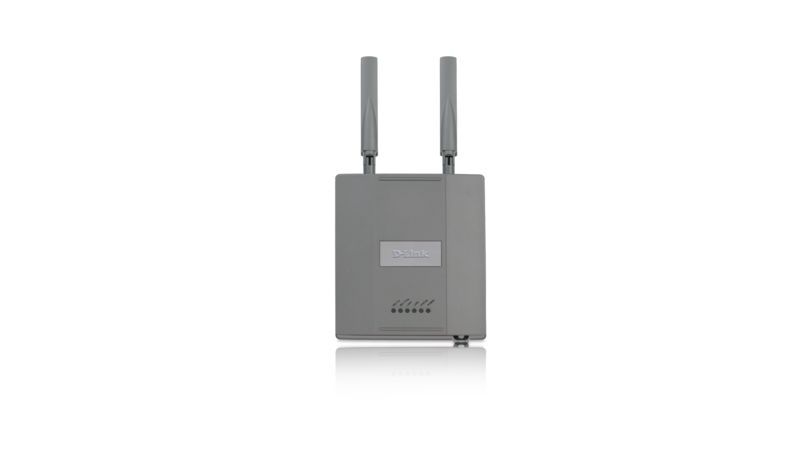 With wireless speeds of up to 108Mbps (11g) and dual high-gain dualband antennas, this access point provides optimal wireless coverage in both the 5GHz 802.11a and 2.4GHz 11g frequency bands. Two LAN ports are provided for MSSID (Multiple SSID) assignement for Main and Gust networks. Enclosed in a plenum metal chassis, the DWL-8200AP adheres to strict fire codes and ensures complete safety. For advanced installations, this access point has an integrated 802.3af Power over Ethernet (PoE) support, allowing installation of this device in areas where power outlets are not readily available. The DWL-8200AP delivers concurrent wireless performance with maximum wireless signal rates of up to 54Mbps (108Mbps Turbo mode) in both frequency bands simultaneously. With dualband connectivity, 2 networks are created both running at full bandwidth speeds, offering a significant increase in total network capacity. At the same time, the DWL-8200AP remains fully backward compatible with the IEEE 802.11b standard in the 2.4GHz frequency. The DWL-8200AP provides the latest wireless security technologies by supporting both Personal and Enterprise versions of WPA and WPA2 (also known as 802.11i) with RADIUS support to ensure complete network protection. Other security features included in this access point are MAC address filtering, wireless LAN segmentation, disable SSID broadcast, and support for Advanced Encryption Standard (AES) data encryption. For additional network access security, if the DWL-8200AP is connected to a switch that supports VLAN tagging (802.1q), the VLAN enabled DWL-8200AP can appropriately provide network access options. Based on VLAN tagging infrastructure, the DWL-8200AP also features multiple SSID support to further help segment users on the network. The DWL-8200AP includes a wireless client isolation mechanism, which limits direct client-to-client communication. The DWL-8200AP can be configured to operate as an access point, Wireless Distribution System (WDS) with access point, or WDS wireless backbone. With WDS support, network administrators can set up multiple DWL-8200APs throughout the facility and configure them to bridge with one another on one band and provide network access on the other. The DWL-8200AP can be configured via a web-based utility or Telnet. D-Link's AP Manager or D-View SNMP management module can be used to manage multiple access points from a single location. In addition to a streamlined management process, the AP Manager or D-View software provide network administrators with the means of verifying and conducting regular maintenance checks without wasting resources by sending personnel out to physically verify proper operation.